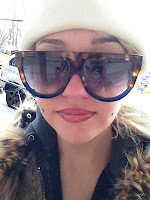 Amanda Bynes has made plenty of headlines for tweeting about how ugly (her new go-to insult) various celebrities are. But she may have finally gone too far when she made a reference to Down Syndrome in one of her latest tweets. The less-than-tasteful move came when she was dissing rapper Drake, her favorite subject for Twitter assaults. This time she posted a picture of the rapper along with the description: "They airbrushed @drake to make his eyes look like he doesn't have down syndrome!" Unsurprisingly, many were offended and the tweet was quickly removed. Tweets at the former actress referenced the post as "vile" and even "evil." Bynes later took to Twitter to issue an apology but apparently failed to notice what people were actually mad about. "I'm sorry about the tweets I said about @drake I didn't mean what I said," she tweeted. "I hope to become friends with him instead of smashing him!" No comment on the use of Downs Syndrome as a comparison point however. Admittedly, Bynes' passive-aggressive behavior toward the rapper is the real attention grabber in this situation. The former starlet has wavered between having a crush on and totally hating Drake. Previously, the actress was all up-ons, requesting that the rapper "destroy" a certain feminine body part of hers. Presumably when he didn't give her a call after the inviting tweets, she began calling him ugly far more often than she has with other other targets such as Miley Cyrus. The ugly-train got a bit uglier when Bynes turned it on her own family Wednesday night. Bynes referred to her own sister as ugly, but it seems like another pseudo-come on to Drake. She was apparently telling the rapper she could still go for despite his ugliness, because her sister is ugly too, and Bynes still loves her, right? The tweet has since been removed. Amanda Bynes is still going strong with her offensive Twitter tirades. The actress took to the social media site (AGAIN) to claim that Drake has Down syndrome, a tweet that naturally offended it’s users. However, in true Amanda Bynes style, she then backtracked on her comments claiming she hopes to become ‘friends’ with the hip hop star. “I’m sorry about the tweets I said about @drake I didn’t mean what I said,” she wrote. It wasn’t long before Amanda was bombarded with fans and fellow tweeters defending Drake and even more so the down syndrome community. This is nice Site and good knowledge!.